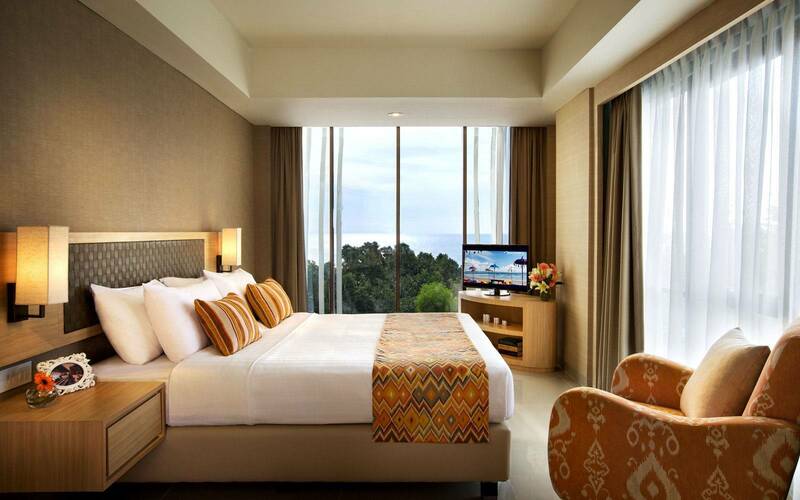 Get the best price with TIC BALI HOLIDAYS, Citadines Kuta Beach Bali is located on the vast, sandy beach of Kuta that stretches out to share its coast with its sleepier cousin, Seminyak. 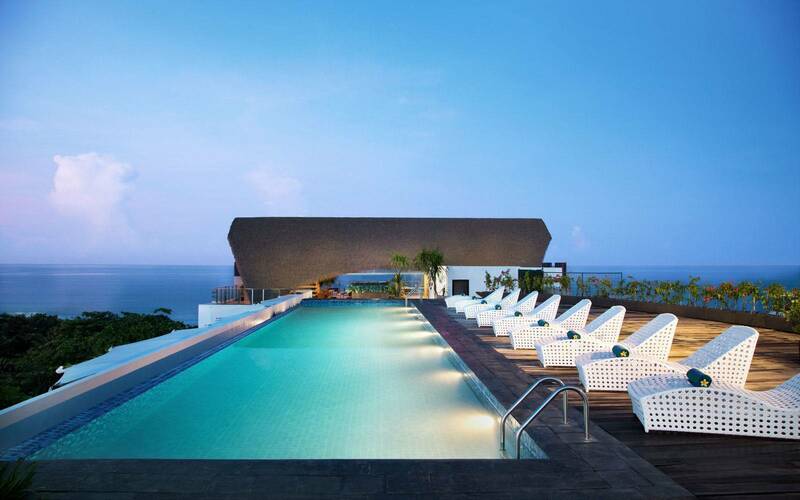 The Citadines residence is located just a street across the beachfront, giving an unparalleled view of the coastline. Surfers and visitors head for the beach in the day thanks to the constant stream of rolling waves. Try your hand at catching a wave at the beach or simply stretch out and bask in the golden sun. Delicious eats, interesting sights and massage parlours line the stretch of Kuta Beach, making it truly convenient for travelers to fill their day with activities. Alternatively, travelers may travel to Jimbaran for seafood fresh off a fishing boat and straight onto a charcoal grill, or Seminyak for its slew of hip cafes and boutiques. Both towns are an easy 20 to 40 minutes away via taxi. 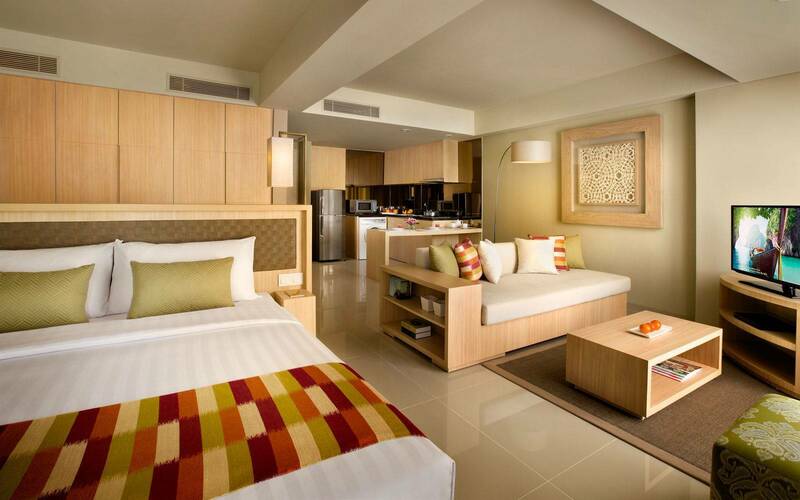 After a day of exploring the beautiful city, retire to Citadines Kuta Beach Bali to relax. Choose from a range of apartment types and services to customize your stay at our serviced residence. The apartments come in various sizes, from studios to generously spacious two-bedroom apartments. To further help our guests feel right at home, enjoy access to a comprehensive list of amenities available in-house such as the fitness corner where visitors get to stay in the pink of health, a rooftop swimming pool boasting of an incredible view, a launderette, and meeting rooms of various sizes. ​Cleverly designed to fully optimize space, the cosy 25 sqm Studio Room is fitted with a sleeping area and shower bathroom. The sleeping area is fitted either with a queen-size bed or twin beds. The apartment itself is modernly furnished with elegant, sleek furniture sporting pops of color, which instantly brightens the space. Each apartment also includes telephone with IDD and voicemail facilities, LED television with cable channels, in-room electronic safe, hairdryer, maximum occupancy: 2 pax and non-smoking room. 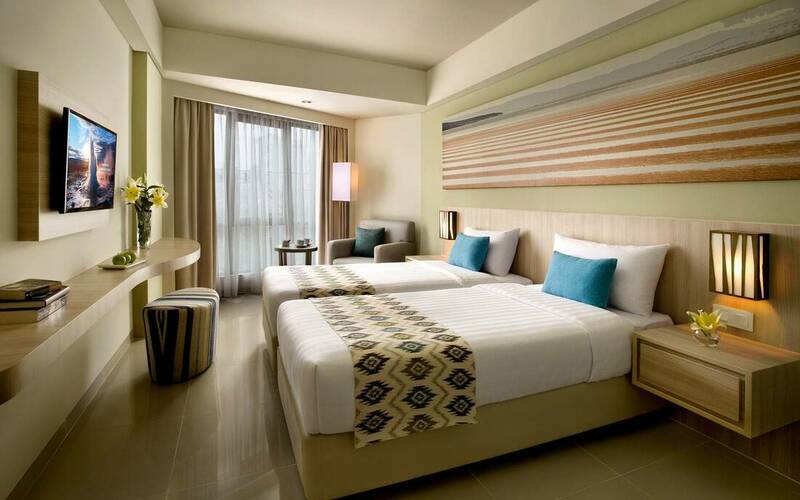 ​Complimentary daily housekeeping and Wi-Fi connectivity are also available. Cleverly designed to fully optimize space, the cozy 25 sqm Studio Deluxe Room is fitted with a sleeping area and shower bathroom. The sleeping area is fitted with a queen-size bed. Each apartment also includes kitchenette, Microwave, telephone with IDD and voicemail facilities, LED Television with cable channels, in-room electronic safe, hairdryer, Maximum occupancy: 2 pax and non-smoking room. Complimentary daily housekeeping and Wi-Fi connectivity are also available. Cleverly designed to fully optimize space, the cozy 25 sqm Studio Executive Room with partial Seaview is fitted with a sleeping area and shower bathroom. The sleeping area is fitted either with a queen-size bed or twin beds. Designed to encompass the trappings that represent the modern, contemporary home of a global traveller, the 1-Bedroom Executive apartment is spacious at 50 sqm. Wake up to a beautiful view of the sea, thanks to the apartment’s generous floor-to-ceiling windows. On top of the abundance of natural light streaming in, the apartment is also decorated with sleek modern furniture in pine while sporting the occasional pop of colour. Each apartment is fitted with a king-size bed in the bedroom, making it a choice abode for up to four guests seeking respite along busting Kuta Beach. In addition, each apartment includes a kitchenette equipped with modern appliances, an LCD television with satellite and cable channels, en-suite bathroom fitted with eco-friendly bath amenities, a washing machine, steam iron and ironing board, and individually controlled air-conditioning. A workstation is also fitted in the apartment for convenience. Ideal for family or with travelling companion, the 2-Bedroom Premier apartment offers a spacious unit with a king-size bed and a Hollywood Twin bed. Guests can relax with a sea view and feel at home with a fully-equipped kitchen, living and dining area, washing machine, and bathroom with bath tub. Begin your day with a complimentary hearty American breakfast spread. Check with our reception staff on the number of complimentary breakfasts that apply to your room. Breakfast costs approximately IDR 110,000++ for every additional guest. Work up a good sweat and stay fit and focused in our on-site air conditioned gymnasium. Prepare for the next leg of your journey at our on-site self-service launderette. Additional charges apply. Choose from our range of meeting and conference rooms to cater to any of your business needs. Work in a couple of laps at our rooftop swimming pool or simply stretch out while taking in the deliciously golden sun and incredible view.